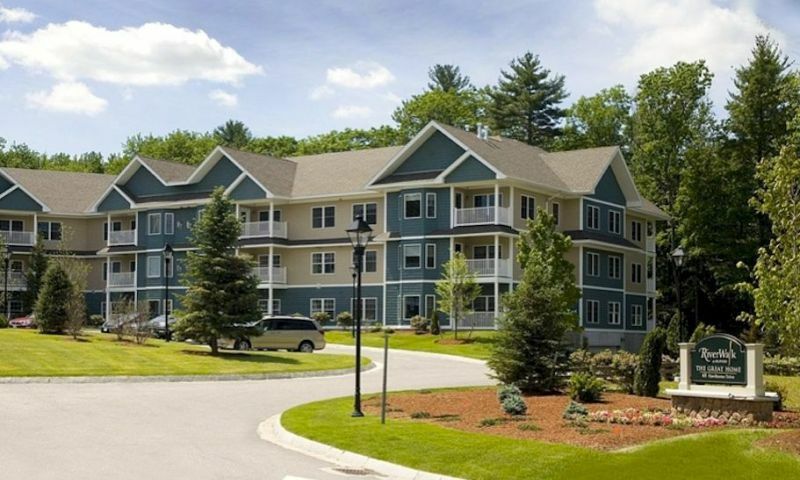 RiverWalk at Bedford is a charming 55+ community located in Hillsborough County, New Hampshire. This active adult community offers a close-knit neighborhood vibe with only 90 low-maintenance residences. Homeowners can enjoy great amenities, an active social lifestyle and scenic views of the Merrimack River as well as attractions near Bedford, NH. Residents of RiverWalk at Bedford get together at the amenity center that is located inside the Great Homes condo building. Active adults can socialize with other neighbors in the gathering room and relax in front of the cozy fireplace or they can stay in shape in the exercise room. The amenity center provides a commercial kitchen and bar area where residents can grab a drink or cup of coffee to start their day. A billiards and game room are also available for fun activities as well as a well-stocked library for the resident bookworm. The computer room makes it convenient for residents to check email and keep in touch with loved ones. Another great amenity is the movie theater where film lovers can enjoy watching their favorite actors on the big screen. The three-level luxury condo building, known as Great Homes, has homes for sale on a resale-basis only. The 62 units are available in floor plans that offer one or two bedrooms and two bathrooms. These units feature elegant G.E. appliances, gourmet eat-in kitchens, high-ceilings, open layouts and luxurious bathrooms. Residents have access to a heated underground parking garage with elevator access. Resale floor plans include Goffe, Bedford, Patten, Wiggin, Walker, Kendall, and Legacy. The Carriage Homes in RiverWalk at Bedford consist of 28 detached homes with five different home styles and range from approximately 1,500 to 3,000 square feet. These single-family homes have two bedrooms, two or two-and-a-half bathrooms, and an attached two-car garage. They feature spacious living areas, hardwood flooring, ceramic tiles, central air conditioning, and a gas fireplace. Carriage Homes are two-story residences with first-floor master suites and have a second floor that provides an additional bedroom, bathroom, loft or storage space. Active adults living in RiverWalk at Bedford enjoy a maintenance-free lifestyle. The condo association fee includes yard maintenance, snow removal, amenities, garbage pick up, and exterior-home maintenance. Thanks to the professional association, homeowners have more time to relax and have fun with other neighbors. They have more time to socialize at the amenity center, participate in activities or organize events with other RiverWalk residents. Some of the activities include movie nights, billiards, cards, board games, and game nights. RiverWalk at Bedford is conveniently located by the Merrimack River in Bedford, New Hampshire. Residents have easy access to plenty of shopping malls, restaurants, medical facilities, and other recreational activities around southern New Hampshire. Day trips are a breeze with the Everett Turnpike and Highway 3 nearby. The community is also close to Manchester, the largest city in the state, and Manchester-Boston Regional Airport, which are both less than ten miles away. RiverWalk at Bedford offers luxury living with a low-maintenance lifestyle in Hillsborough County, NH. There are plenty of activities available in RiverWalk at Bedford. Here is a sample of some of the clubs, activities and classes offered here. Great Homes is a three-story condo building offering one and two bedroom floor plans. These condo units are available on a resale-only basis and feature elegant G.E. appliances, gourmet eat-in kitchens, high-ceilings, open layouts and luxurious bathrooms. Residents have access to a heated underground parking garage with elevator access. Please Note: Not all floor plans are available at this time. Carriage Homes in RiverWalk at Bedford offer approximately 1,500 to 3,000 square feet of living space. These detached homes are available as new construction and resale. They feature spacious living areas, hardwood flooring, ceramic tiles, central air conditioning, and a gas fireplace. These two-story homes have first-floor master suites while the second floor has an additional bedroom, bathroom, loft and storage space. Please Note: Not all floor plans are available at this time. 55places.com is not affiliated with the developer(s) or homeowners association of RiverWalk at Bedford. The information you submit is distributed to a 55places.com Partner Agent, who is a licensed real estate agent. The information regarding RiverWalk at Bedford has not been verified or approved by the developer or homeowners association. Please verify all information prior to purchasing. 55places.com is not responsible for any errors regarding the information displayed on this website.